It’s delightful, it’s delicious, it’s de-lovely! Anything Goes, a musical masterpiece, is witty, fun and, dare I say, sassy. This production is a third time adaptation of a show, originally directed and produced by Vinton Freedley in 1934, that has, yet again, graced the ports of Houston. Directed and choreographed by Kathleen Marshall, this particular production of Anything Goes will feature award winning songs by Cole Porter, including “I Get a Kick Out of You,” “You’re the Top,”and “Anything Goes.” Since its original Broadway debut this show has been readapted for television, off-Broadway, and international audiences thirteen times. Sarofim Hall at the Hobby Center will be the launching site of Broadway Across America’s 6 month national tour. Dynamic and enviously talented, Emma Stratton brings to life the character of Reno Sweeney, a bold and effortlessly ostentatious evangelist turned night club singer. Stratton’s presence, as the S.S. American’s leading lady, goes undoubtedly unmatched. In conjunction with her belting voice, impeccable dedication to character, and tantalizing tap routines Stratton is a triple threat; and, without question, a force to be reckoned with. Her talented, confident, and clever character will no doubt keep you wanting more. By her side costars Brian Krinsky, playing the role of Billy Crocker, a young and hopeful Wall Street broker who, risking it all, will stop at nothing to win back the girl of his dreams. Crocker, charmingly naïve, is classic and cavalier—he is a true gentlemen. Krinsky, never skipping a bit, successfully embodies the presence of this charismatic stowaway. The real partners in crime, Krinsky and Stratton, hitting every note and punch line, together generate an energy that is infectious. Forming part of the principal cast follows Rachelle Rose Clark, starring as Hope Harcourt, the beautiful and wealthy debutante, heiress to family fortune; Richard Lindenfelzer as Lord Evelyn Oakleigh, Hope’s quirky but wealthy fiancé, who, as we will soon discover, is a little bit Gypsy adorn the stage alongside the very dynamic and talented Erma and Moonface Martin, brought to life by Mychal Phillips and Dennis Setteducati respectively. Sharing an impeccable comedic timing, this sappy sextet will prove true that aboard the S.S. American anything goes…not that you will mind. 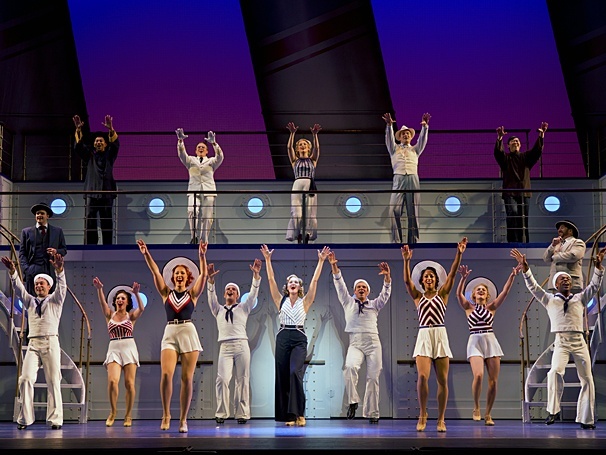 Be sure to catch them at the Hobby Center’s Sarofim Hall until October 19th before this ocean liner bids bon voyage.